This is the second part of our Plesk Tutorial Series. If you're configuring a new VPS we recommend starting with part 1. Automated bots continuously scan IPs for vulnerabilities. To prevent security issues on your VPS, configuring the security of your VPS is the first thing we do after the installation. Given the large number of IPs used by bots, we cannot include all attacking IPs in our own firewall, nor do we receive reports of attempts to penetrate your VPS. As such, it's important to have solid security on your VPS. 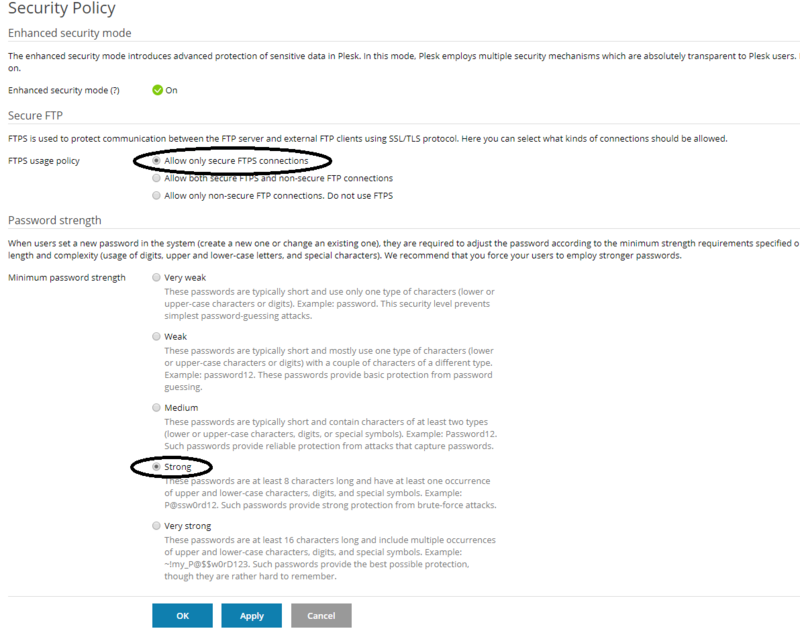 Limit access to Plesk to specific IPs. Securing localhost & mail with SSL. This is relatively complex material. If you use the steps below to secure an existing (instead of new) VPS, then always create a snapshot of your VPS first before you follow the steps below.That way you always have a snapshot to fall back on if it turns out that a change creates a problem. The root user does not have SSH access to your VPS by default. Additionally, we recommend changing your SSH port. This is a form of 'security through obscurity'; by changing your SSH port, you make your VPS invisible to most of the attacking bots (if not all bots). An additional advantage is that your log files remain organized and you get a clearer picture when your VPS is actually attacked directly, instead of randomly by a bot. Connect to your VPS via the VPS console in your control panel or via SSH. Check your used ports with the command below. An overview as shown in the screenshot below appears. 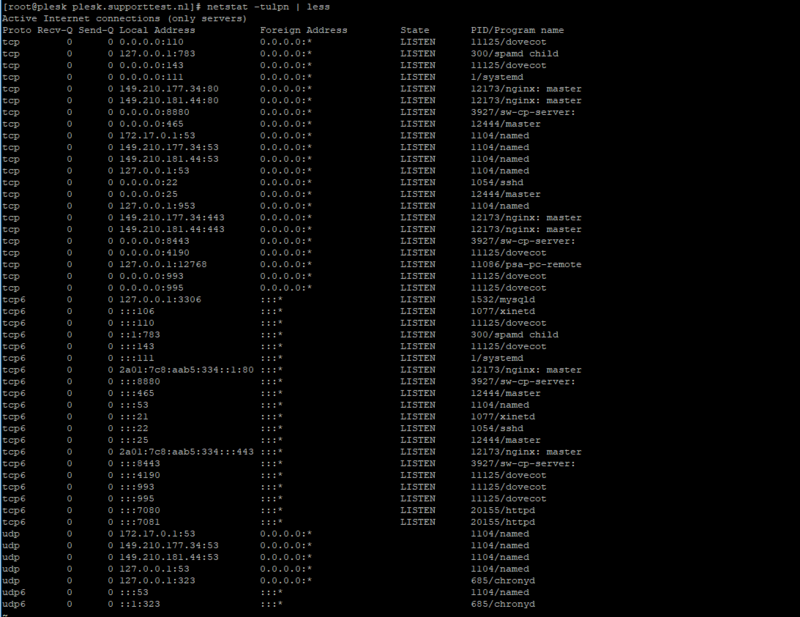 In this overview, the port numbers are the numbers in the row 'Local Address' behind the colon. Choose a random port number between 0 and 65535 that is not shown in the overview (for example 47592) and press 'q' to stop netstat. Open the SSH configuration file with the command below. You can also use vim for this. The configuration file opens, and you will see the code below, among other things. Save the file and close the file by pressing ctrl + x > y > enter in succession. Add the chosen port to your firewall with the command below. Replace 47592 with the port number you selected in step 2. Firewalld manages iptables in Plesk. Commands for iptables that you might already be familiar with, such as 'systemctl status iptables' do not work. Replace 47592 by your chosen port number. Bots try to enter automatically by performing brute force attacks on your VPS in different areas, such as SSH, Postfix (outgoing mail server), and Plesk. Fail2Ban offers good protection against this. Fail2Ban protects your VPS by banning IPs that try to abuse your VPS, for example in too many wrong password attempts, searching for exploits, etc. We therefore recommend Fail2Ban wholeheartedly. Log in to Plesk and navigate to 'Tools & Settings'> 'Updates and Upgrades'. Select the dropdown icon for Fail2Ban and select 'Install'. Click on 'Continue' to install Fail2Ban. You will see a confirmation of the installation. Now return to 'Tools & Settings'> 'Updates and Upgrades'. 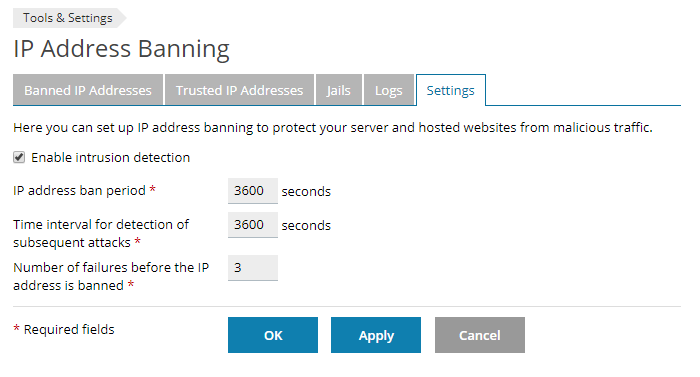 You will see that a new option has been added under 'Security' called 'IP Address Banning (Fail2Ban)'. 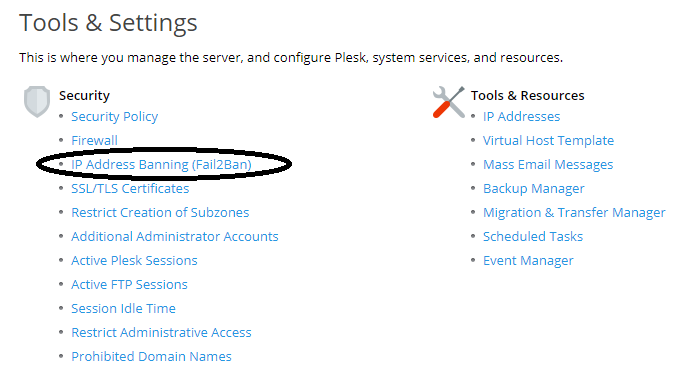 Click here to configure Fail2Ban. You enable Fail2Ban by ticking 'Enable intrusion detection'. By default, attacking IPs are banned from your VPS for ten minutes. We recommend setting this to one hour as in the screenshot below, but you are free to adjust this as you wish. Switch to the 'Jails' tab. A jail can be viewed as a piece of additional configuration within the general configuration of Fail2Ban, in which the security of a service is specified. Select all jails and click on 'Switch On'. 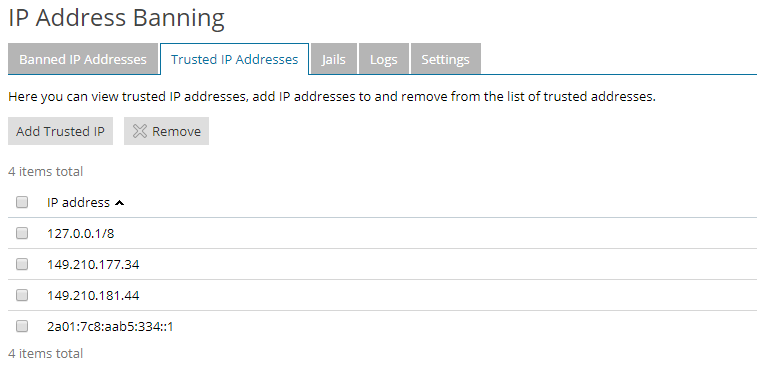 Finally, click on 'Trusted IP Addresses'> 'Add Trusted IP' to protect your IP address from which you connect to your VPS. This way you prevent that if you make a mistake in your password, you accidentally ban yourself. Enter your IP address and click on ‘OK’. Our VPSs with Plesk standardly use 'iptables' as a firewall and are managed from 'firewalld'. 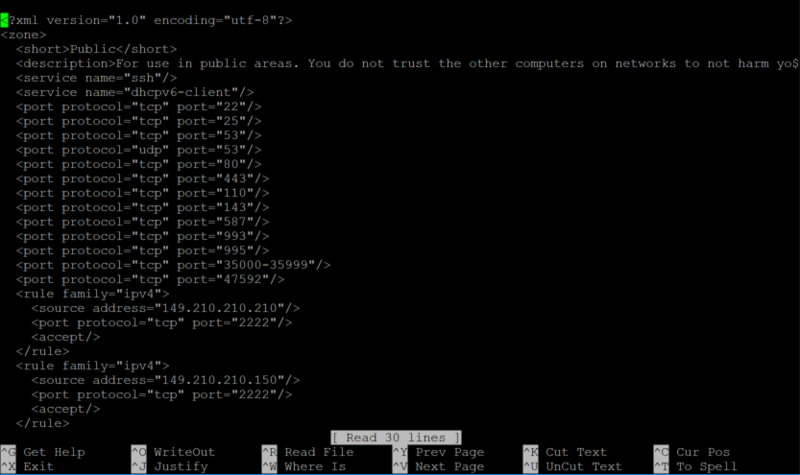 In Firewalld, you can choose to allow specific IPs only to connect to port 8443. Port 8443 is the port you connect to when you use Plesk. With the commands below, you create an exception for your own IP address so that only your own IP can connect to port 8443. Replace 1.2.3.4 with your actual IP address. You can repeat these steps to give more IPs access. Reload firewalld to process the changes. You will see the overview below. You can also use the steps in this section to close other ports. Do this only when you are very certain, for example if an IP attacks a specific port. ClamAV is a free, open source anti-virus program for the detection of trojans, viruses and malware on your VPS. Log in to Plesk and navigate to 'Tools & Settings'> 'Security Policy'. Secure FTP: Allow only secure FTPS connections. Your localhost and mail are automatically protected with a self-signed SSL certificate that uses TLS v1.2. SSL is based on trust. Self-signed certificates are less suitable than Let's Encrypt, or your own SSL certificate, since there is no CA authority issuing the certificate. In the SSL system trust in a self-signed certificate is therefore more limited. As such, we recommend using Let's Encrypt or your own SSL certificate. 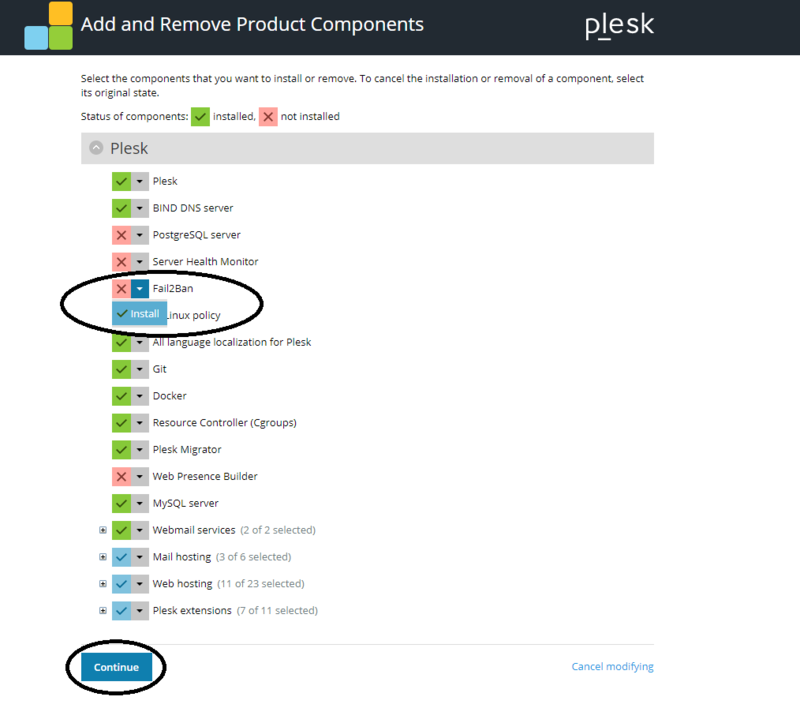 How you do this is explained in our article ‘Installing an SSL certificate in Plesk’. In this article we also explain how you secure your website. We get back to this in part 5 of this tutorial series, in which you upload your website and database. You have set up solid security for your VPS to keep out pesky bots with the above steps! Click here to continue to Part 3: Updating your VPS.